The story of President Lincoln's assassination is well known but perhaps not as well known is the story of a Ferree descendant who became an eyewitness to events of that night and found what is now considered a historical relic. Newton Ferree, son of Harvey and Margaret Lowe Ferree, was a seventh generation Ferree descendant through the Philip and Leah Dubois Ferree line. As a commissioned army officer, in April 1865 at the age of 21, he was serving as a government clerk at the Examining Office of the Paymaster General. April 14th 1865. President and Mrs. Lincoln were attending a performance of "Our American Cousin" at Ford's Theatre. As they sat in the president's box watching the performance, John Wilkes Booth opened the door, entered, and fired a shot. A physician, Dr. Charles A. Leale, who was also attending the performance rushed to help. Another physician, Dr. Charles Taft also made his way into the box. They struggled to remove Lincoln's collar and shirt to find the wound. The collar was finally cut free with a jackknife. As Lincoln was carried away the collar fell to the floor. Newton Ferree was not in attendance that night but was close by. He kept a daily diary and the following is from his pocket diary entries for February 1st to May 22nd, 1865. Lt. Ferree and a friend, William T. Kent, had followed a torchlight procession to Edwin Stanton's house where the secretary was serenaded and made a speech. As the procession moved off "we went to the Falstaff House about half-past ten o'clock. I went out the front door. I then heard someone over at Ford's Theatre cry out fight. I ran over and went in and found the audience all on their feet crying out to hang someone. 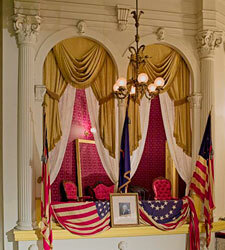 I jumped on the stage and learned that President Lincoln had been assassinated. I then started to go in the box where the President was but met five or six men carrying him out. I picked up the collar which had been torn from the President's neck. I then went in and found it one pool of blood. When I heard of the President being assassinated it almost set me wild". The rest of the entry describes his restless night and a return to the vicinity of the theatre "to hear if the President was still living. He was but died a few minutes after I arrived. It commenced raining a few minutes before this and continued raining all day. I spent the day wandering gloomily around the streets. By noon the whole city was draped in mourning". He commented "The South is avenged". is a doubled over piece of white cloth about 1.5" x 8" soiled and bloodstained with one particularly sizeable brownish-red bloodstain at one side. In 1969 the collar and Newton Ferree's diary were acquired by Dr. John Lattimer, a collector of historical relics, who did extensive research on the Lincoln and Kennedy assassinations. After his death in 2007, selected items from his various collections were put up for auction. The collar and diary were sold at the 2008 November: The John Lattimer Collection of Lincolniana Grand Format Auction for $65,725. is located at 511 Tenth Street, N.W. In 1865, Ford's Theatre lay north of two of the worst neighborhoods in Washington. A center for crime and vice only a block and a half away. The building was built in 1833 as a Baptist church. After merging with another church, the congregation leased it in 1861 to John T. Ford who later bought it and turned it into a theatre. In 1866 it was sold and used as office space by the Federal Government. In 1893 all three floors collapsed killing 22 workers and injuring 68. From then until 1931, the building was used for storage. The Lincoln Museum on the first floor was opened on February 12, 1932. One year later it was transferred to the National Park Service. Ford's Theatre reopened its doors in 1968 giving live performances and producing several shows each year. It is one of the most visited sites in the nation's capital. was born in November 1844 in Fayette County, Pennsylvania, the seventh child of Harvey and Margaret Lowe Ferree. He enlisted on February 5, 1864 and was commissioned an officer in Company C, Ohio, 157th Infantry Regiment. He and wife, Rose married about 1869. They had two sons: Sheridan and Newton. Lt. Newton Ferree died in Washington, D.C. on February 20, 1928. Rose died September 19, 1930 in Washington, D.C. Both are buried in Arlington National Cemetery. Letters Newton Ferree exchanged with his brother and his cousins in the Henry Large family can be viewed on this website. Go to: "Family Letters".